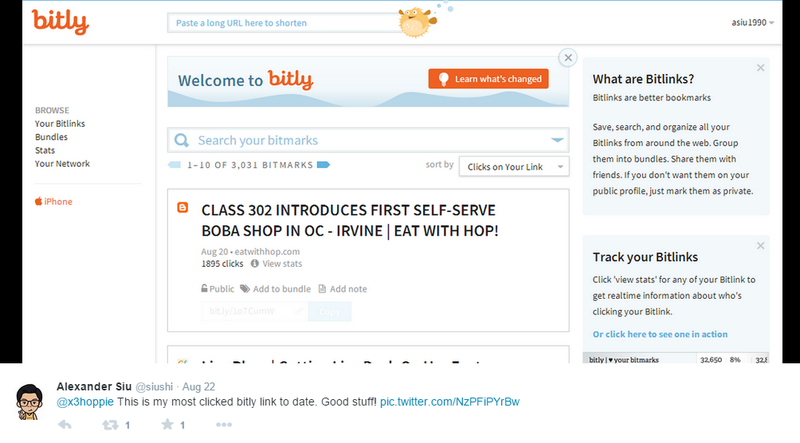 @SIUSHI'S MOST CLICKED BITLY TO DATE - CLASS 302 SELF-SERVE BOBA - EAT WITH HOP! Not going to lie but when I saw this on twitter a few months ago that not only did Alexander Siu (@siushi), the marketing director for the 626 Night Market and fellow foodie, tweet my article, but in addition to that, it ended up being his most clicked bitly! (bitly is a url shortening service). I got all sorts of giddy! Maybe it pays to be one of the first to write about a certain place because this post of mine got a lot of attention! More than I would ever expect! It's also because of the content too... I mean, I would totally be interested in an article about a self-serve boba shop.